This exciting milinery exhibition was held at the historic Artworkers' Guild in Bloomsbury which made for a beautiful setting. Supported by the Worshipful company of Feltmakers, as part of London Craft Week 2018. 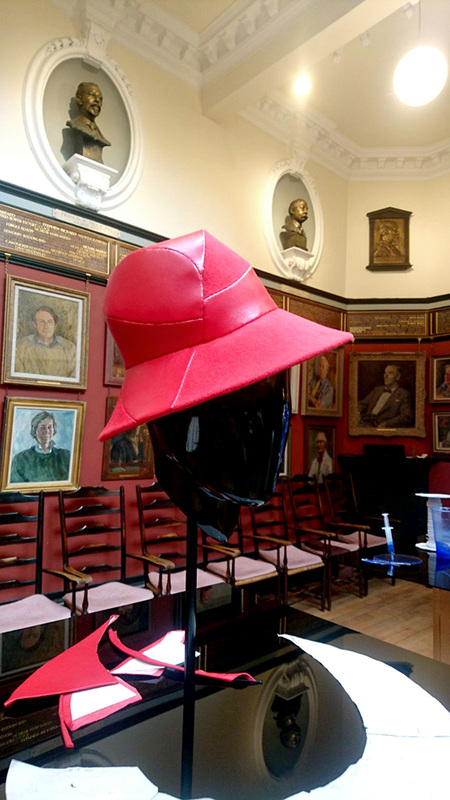 Karen created a one-off hand-stitched red hat especially for the exhibition. The design is based on the 'Mitzi' brimmed hat but created with traditional couture millinery stitching. Featuring Karen's distinctive tailored and sweeping seams, the sheen of the red leather contrasts with the soft texture of the felt. The exhibition showcased a number of talented British milliners, and was organised by fellow milliners Edwina Ibbotson, Rachel Trevor-Morgan, and Noel Stewart. Thanks to all who came along! The leather and felt 'Mitzi' is a one-off, but please get in touch if you're interested in commissioning your own. You can view other women's brimmed hats by Karen Henriksen in the shop.